The first step is to purchase some good quality reusable jars. My personal favourites are the Bernardin 125 mL mason jars with snap-on lids. However, I really dislike the snap-on lids because the lids and jar rings rust easily. I recently became aware that there are BPA-free screw-on caps available for these jars. I’ve ordered them and I can’t wait to use them. They are refrigerator, freezer and dishwasher safe as well! Decide what types of foods you want to prepare. This will often depend on your child’s age and the complexity of the food you wish to make for them. I initially started my baby food preparation with vegetables such as corn, carrots and peas. After a while I added meat to her diet (turkey and chicken). Of course, I chose organic foods but you can choose whatever suits you and your family. If certain vegetables are not in season, you could always choose frozen vegetables. I particularly liked Stahlbush Island Farms frozen vegetables. Not only are they organic but they’re affordable and available at many local grocery stores. How will you prepare your food? I chose to steam my vegetables and meats. A steamer is a great way to preserve the nutritional value of food. Most steamers come with instructions for timing the cooking for optimal flavour and nutritional value. I found these instructions exceptionally helpful! All of the food I made was prepared in a blender. A food processor could be used as well. I would prepare one batch at a time, washing the steamer tray and blender after each batch. I would prepare the meat last to ensure there was no accidental contamination of the vegetables. Remember good food handling practices. Before filling jars, make sure they are clean and sterilized. The sterilization process does not have to be as arduous as when canning (since your foods will never be stored in a pantry) but it’s good to ensure that all the jars and lids have had at least a 3 minute boiling water “bath” prior to filling them with food. I would fill the jars about 3/4 full. Make sure to write the date that the food was prepared and the contents of the jar on the lid. I found that a piece of scotch tape and a permanent felt-tip pen worked well for labeling. Just look at those beautiful colours! How to store your food. Foods should be stored in the refrigerator or freezer. I usually placed a two day portion of food in the fridge and the rest I stored in the freezer. With my little girl, we found that 36 jars of food would last about 6 – 7 days. Therefore, I only had to make her food once a week. It would usually take 2 – 3 hours to prepare 36 jars. How will you serve your food? Consider how you will warm your baby food. It doesn’t make sense to make such wonderful, nutritious foods only to zap them in the microwave! We would warm a bowl of water in the microwave and then submerge her jars in the hot water for about 10 minutes. Remember to only introduce one new food at a time. It’s always good to know how your child is handling and processing the foods that are being introduced to them. You may want to keep a food diary for your child while you are in the phase of trying new foods. 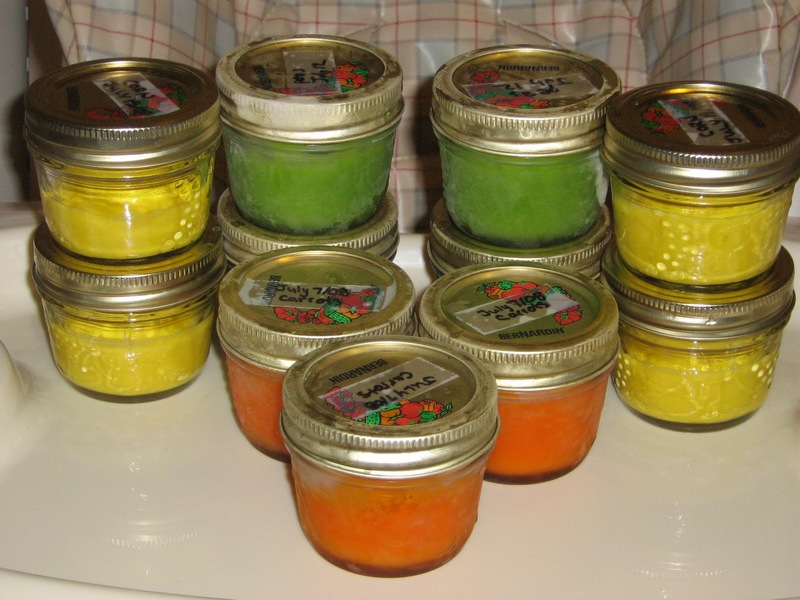 I hope these tips have helped and inspired you to consider preparing your own baby food. Please feel free to share any of your tips, suggestions or comments on baby food preparation. Thanks so much for the tips! I definitely want to make my daughter’s food all from scratch this time as I did not do so as much for my first child. I have alway made all my kids baby food from scratch – even if I’m unprepared; mashed banana avocado and yoghurt is a great instant (non-processed) meal. I also freeze portions in an ice cube tray (and then pop out once frozen and place in a zip lock bag. I can then defrost the just amount I need without defrosting a whole jarful. I never used ice cube trays but I would also make smaller, half portion jars. I think this time around I’ll try the ice cube tray idea (as long as I can find ones that are BPA-free). I too would do on-the-spot baby food. Like you suggested, mashed banana and avocado were always a hit in our house! I also made (me and my husband did) all of our baby’s baby food. We wanted to KNOW what was in it, and to make sure it was fresh. 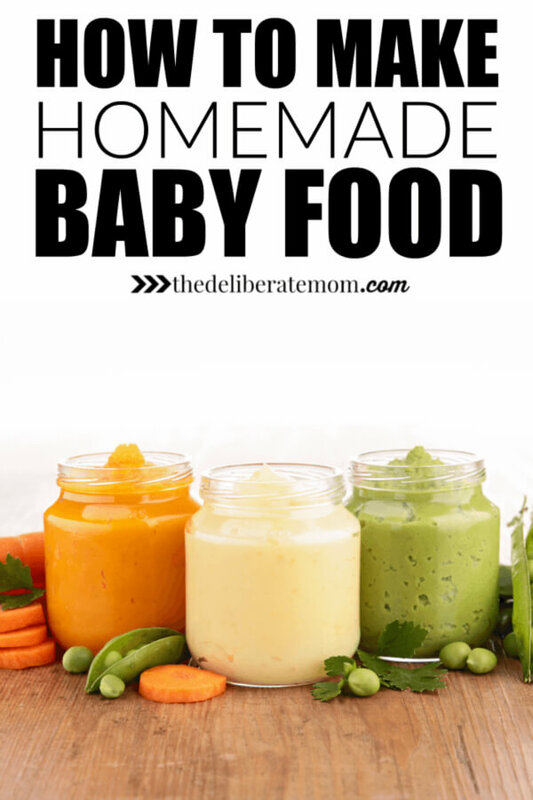 I am your newest follower from MBC and love this post about homemade baby food! I have been making my son’s food since he started on solids but haven’t bought any books yet…thanks for the references. We never gave our girls store bought baby food… just mushed up bits of organic fruits and veggies! Thanks for sharing your post with us! I hope you join us again (yeah I know it’s a day late… linky issues) at Eco-Kids Tuesday! !